Ideal for the people who love a good mystery in their jewellery selection, Baltic Ambers date back to millions of years. Dotted with strands of DNA from another era, these stones have more history than most and you can get them at TJC!. Aged back 40 to 60 million years, Baltic Amber contains opulent history! In fact, if you peek in closely, you can practically see the history lodged within the stone with strands and remains of matter dated back. Researchers claim that the some prized collections of these stones are known to contain over 1000 species of insects that are now extinct. Given the age of these gems, there are also a lot of legends and stories related to these stones. You can find all such information, and more, below. It is hard to find out just when the process of formation started, of these stones. However, ever since man can recall, he has been curious of the honey-coloured stones that have washed up at the shores. Little did the prehistoric man know, they contained masses of a pre-historic era etched inside them..
Prized for their healing properties and historical importance, these stones are mainly found in the areas near the Baltic Sea, Europe. Dated back from 44 million years, the stones are considered to be formed out of resins from trees. It is also the reason why that when they’re burnt, they emanate a humid, forest-like pine smell. Baltic Ambers also rate 5-6 on the Mohs scale of hardness, which means that they can be easily scratched and broken. Therefore, you need to take care of your jewellery. Reflecting a fascinating honey-yellow tinge, this stone looks something out of medieval history transported in modern times. Although it doesn’t glitter as much, the optical brilliance of the stone has kept several people awed since forever. In regards with how big they can, it all depends on the supplier. The amber can be found in the size of small beads to slightly bigger stones. If you look in closely, you may find some matter lodged in the amber piece. It is because tree resin is a sticky substance. When the resin is drying out, it catches all sorts of insects and other matter. This fossilised resin is the amber that we’re speaking of. So, you can be delighted knowing that your jewellery contains tangible traces of another era. There’s one thing that makes this stone special than any other gemstone, and that is the presence of Succinic Acid. Now, the said acid is found all the bodies of humans and is an alkalinizing acid, which means that it doesn’t affect the body’s acidity if not decreasing it. This acid is also very helpful for mild pains, which could be due to anything from teething to arthritis. Succinate has been known to act as analgesic as well as anti-inflammatory compound, which is also recognized by the medical and the pharmaceutical industries. This is the reason why it is regarded with reverence in the communities respecting organic healing. Given their age, it’s no surprise that Baltic ambers rank quite high in terms of importance to all the healers across the world. There have been several legends and stories related to how pure, positive, and reverent the stone is. The widest use of the stones is for the succinate acid found in it. Many believe that wearing the stone helps them fight against the pain of arthritis or teething. Some people claim that the stone has helped them fight skin-related issues as well. Healers claim that if the people suffering from ailments wear it round-the-clock for about 4 to 5 weeks, they will observe positive changes and progress in their health. One can find a diverse range of bracelets and pendant that contain this stone. It is believed that the warmth of the human body releases the anti-inflammatory and analgesic components on the skin surface, which are later absorbed by the body. This is how ambers help babies from being colicky at the time of teething. In Austria, Germany, and Sydney, you will find a lot of local vendors selling jewellery laced with these stones. However, it is crucial to note that you must never ingest the stone; only wearing it is sufficient. Baltic Amber is actually the stone shown the famous movie “Jurassic Park,” where they retrieve the DNA for making dinosaurs. People of the early ages believed it to be magic stone as it produces static when rubbed together. It is also emanates a sticky, sweet aroma when it burnt. The smoke bellowed from this fire was used to cleanse the air during childbirth in older times. The stone ranks low on the Mohs scale – 5 to 6, which means that it susceptible to scratching and abrasions. 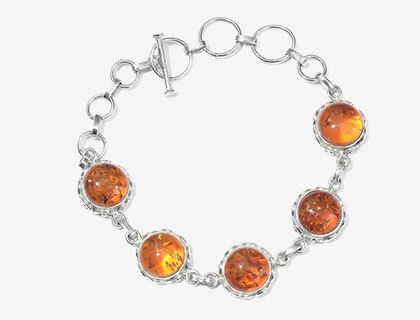 Lots of people suffering from migraine and arthritis wear bracelets and pendants sporting the amber as it is known to release small amounts on succinate acid, which is an analgesic component found within the stone.